Home › FAQ › What is the Difference Between the ACT and the SAT? Knowing the difference between ACT and SAT exams can be helpful in choosing which one to take. While these tests have similarities, their differences can play to test-taking abilities in unique ways. Potential college students can buy ACT and SAT books with explanations of each test component and sample questions. For more hands-on practice and insight into test-taking strategies, test candidates can also enroll in ACT or SAT training sessions administered through tutoring services, high school counseling departments or local colleges, according to Bloomberg. Listed below are some main test differences to consider. The traditional SAT tests aptitude, which involves using reasoning skills and verbal abilities to solve problems as opposed to simply knowing information. By comparison, the ACT assesses achievement from a more content-based perspective. Even so, each test requires students to use some measure of analytical thought to demonstrate competencies learned in core subject areas expected from high school graduates. The SAT asks 170 reading and math questions over 10 sections and requires a written essay in three hours and 45 minutes excluding breaks. The ACT takes three hours 25 minutes to answer 215 questions in four subject areas and write an optional essay. SAT reading selections place considerable emphasis on vocabulary so good language skills may create a test advantage. Both essays assess grammar skills, however the ACT emphasizes punctuation in particular. The ACT requires writing from a persuasive point of view to provide a counter-argument to a question. The SAT prompt seeks support for an issue from historical, literary or personal perspectives. Both tests assess arithmetic, algebra I and II, functions and geometry. However, the SAT also includes data analysis and provides some formulas in the test booklet, while the ACT has some trigonometry and provides no formula hints. The ACT includes biology, chemistry, physics and earth science material and the SAT does not. 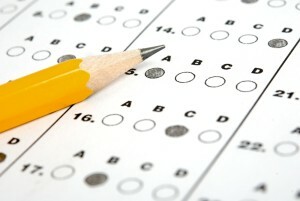 In general, SAT questions tend to become more difficult from the beginning to the end of a test section. The ACT intersperses questions of higher difficulty throughout each assessment area and leans towards asking questions in a more straightforward manner that requires less deciphering, according to International Business Times. In math, questions on the ACT are completely multiple choice, while the SAT requires some responses to show written solutions. Finally, college admissions personnel tend to look for the ACT’s composite scores to show how test takers measure up against each other as opposed to the SAT where main section scores are used for comparison. When considering whether the SAT or ACT is the best test to take, candidates should look at which test showcases their assessment style, knowledge base and reasoning abilities. Schools located on the East and West coasts, as well as private institutions, tend to favor giving the SAT. Those in the South and Midwest gravitate towards the ACT. Regardless of any difference between ACT and SAT exams, students can take either or both tests to satisfy college entrance requirements by four-year colleges and universities nationwide.